Israeli soldiers invaded, on Sunday at dawn, several Palestinian communities in occupied East Jerusalem, Hebron and Bethlehem in the West Bank, and kidnapped four Palestinians, including a former political prisoner.Local sources in Jabal al-Mokabber, in occupied East Jerusalem, said that several military vehicles invaded the Schools Street, and a number of neighborhoods, and kidnapped two Palestinians after searching and ransacking their homes. The kidnapped have been identified as Ramzi Ahmad ‘Oweisat, 31, and ‘Ala Khaled ‘Oweisat, 22; they were moved to an interrogation facility in the city. 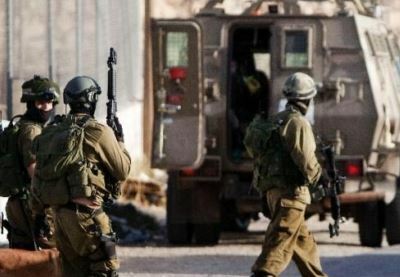 In addition, soldiers invaded the Deheishe refugee camp, south of the West Bank city of Bethlehem, and searched several homes before kidnaping ‘Odai Hussein Hammash, 26. The soldiers also broke into the home of ‘Ammar Mustafa al-‘Aker, 31, in Deheishe, and the home of Mahmoud Taqatqa, 26, in Beit Fajjar nearby town, and handed them military orders for interrogation in the Etzion military and security base, south of Bethlehem. In Hebron, in the southern part of the occupied West Bank, soldiers invaded Doura town south of the city, and kidnapped a former political prisoner identified as Hamad Bassam az-Zeer. His father said a large number of soldiers broke into his home, and violently searching it, before assaulting his son Hamad, 27 years of age, and kidnapped him. He added that his son is a former political prisoner, who was just released from an Israeli detention center less than two months after spending several months held under arbitrary Administrative Detention orders, without charges or trial. Hamad previously spent more than six years in a number of Israeli prisons, detention and interrogation centers.